Pilot. Smuggler. General. Doer of the Kessel Run in less than twelve parsecs (if you round down). Academy Award nominee. These are just some of the titles that could now, at least tenuously, be applied to Han Solo. The last on that list is the latest accolade to bestowed upon the character after today's announcement that Solo: A Star Wars Story was nominated for an Academy Award for Best Visual Effects. Also nominated in that category were Avengers: Infinity War, Christopher Robin, First Man, and Ready Player One. Best Visual Effects is the only category Solo was nominated in, tying it with Attack of the Clones and Revenge of the Sith for least Oscar nods (those films were nominated for Best Visual Effects and Best Makeup, respectively). Rogue One is next with two nominations, followed by The Phantom Menace and The Empire Strikes Back with three each. Return of the Jedi and The Last Jedi were each nominated for four Oscars, and The Force Awakens was nominated for five. The most nominated Star Wars film was, unsurprisingly, the original 1977 film, A New Hope, which picked up ten nominations and won six. The Empire Strikes Back was the last film to win an Oscar, picking up the 1980 award for Best Sound Mixing, though both Empire and Return of the Jedi received Special Achievement Oscars for Visual Effects. While Star Wars only picked up one Oscar nod this year, there were several people associated with the galaxy far, far away that also picked up nominations. Kylo Ren actor, Adam Driver was nominated for Best Supporting Actor for his role in BlackKKlansman. Also nominated in that category was Richard E. Grant for Can You Ever Forgive Me. Grant will be appearing in Star Wars Episode IX in a still unknown role. And finally, composer Ludwig Göransson, who will be writing the score for the Disney+ series The Mandalorian, was nominated for Best Original Score for his work on Black Panther. 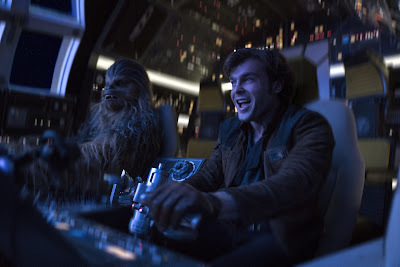 Congratulations to the VFX team that worked on Solo, and best of luck on February 24th.